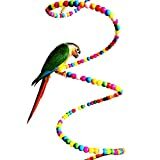 Colorful, beautiful, your bird will surely enjoy it . An ideal place designed for your little friends to play and climb, easy install in the cage. Colorful, beautiful, your pets will surely enjoy it . Prevue pet products naturals large rope ladder bird toy 62807 is handmade from 100-percent natural, eco-friendly, materials providing your bird with mental stimulation and rugged physical play. made with hevea wood branches and natural sisal rope the irregular shape of this bird toy encourages foot exercise. toy connects easily to cage with quick-link attachments and is hand made – actual measurements may vary slightly. as always, supervise birds at play. our naturals large rope ladder bird toy is approximately 26-inch long and 6-inch wide, ideal for medium to large sized birds. 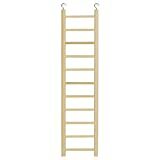 A beautiful wooden ladder to make sure birds like budgies and cockatiels stay active. It is available in three different sizes: PA 4002, PA 4004 and PA 4006.